If you haven’t noticed the hole in Subaru’s current product lineup, Subaru certainly has. In his presentation at the Subaru Ascent launch in McMinville, Oregon last week, Subaru Advanced Product Concept Manager Peter Tenn pointed right to it on a chart. 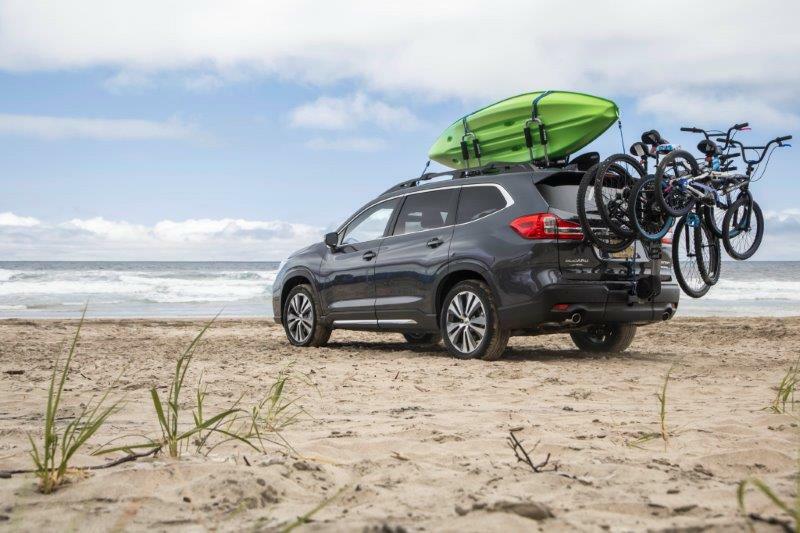 Subaru just recently sold its 9 millionth vehicle in North America, but when its dedicated fan base needs a vehicle to move more than five people or haul a trailer, they’ve had to move along to other brands. 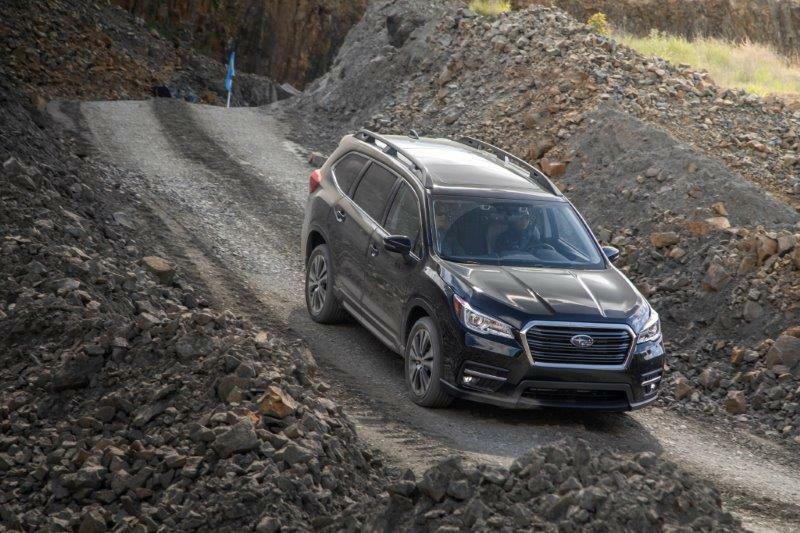 That all changes with the 2019 Subaru Ascent, the largest Subaru vehicle ever produced. 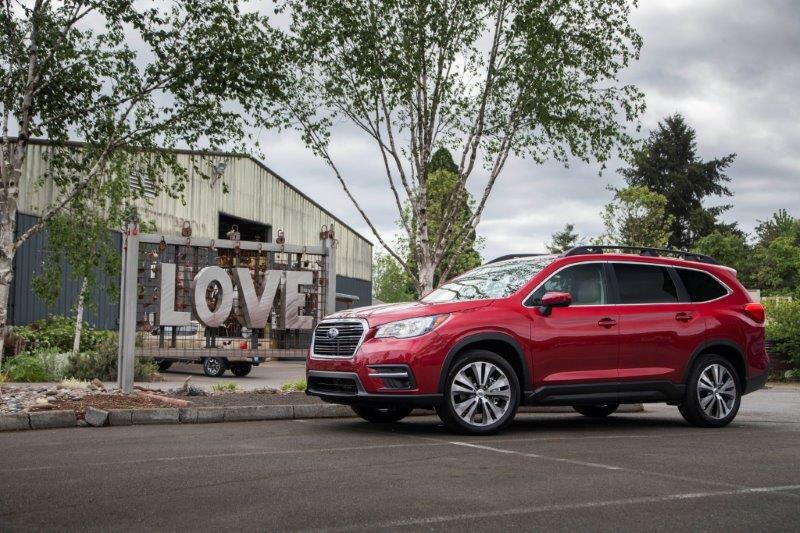 With it, Subaru can check the boxes that have made mid-sized crossover SUVs so popular in the U.S.: Room for up to eight passengers. 5,000 pound maximum towing capacity. Storage space, even when all eight seats are deployed. But unlike other manufacturers, Subaru offers all of this with its legendary all-wheel drive system as standard equipment — even in the base model. Fuel economy is among the best in its class, and it’s matched with a fuel tank that can provide up to 500 miles worth of range. And just as importantly for Subaru’s reputation for safety, its EyeSight advanced collision avoidance system is standard on every single trim level. We’ve said this before, and we’ll say it again: crossover SUVs are not the most engaging vehicles on the road. They fill a need for a lot of consumers that probably should be driving minivans, but hate the idea of surrendering completely. Subaru has built one of these before, known as the Tribeca. “We learned a lot from our experience with the Tribeca,” said Peter Tenn. I asked him what, exactly, the company learned. By 2010, Subaru was routinely selling about 250 Tribecas a month, which is about as close to a sales disaster as you can get. It’s a little unfair, since the Tribeca was introduced just a few years before our collective finances took a digger in 2008, but even after the markets recovered a bit, Tribeca sales never did. Turns out that while the Tribeca had room for seven, it did so at the expense of any appreciable cargo space. 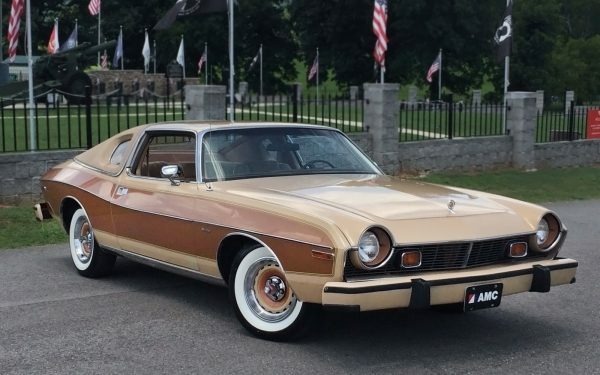 The Tribeca was also a fuel hog, thanks to a 3.0-liter horizontally opposed six at launch, then a 3.6-liter six that rolled out in 2008. At best, a Tribeca would deliver 21 miles per gallon on the highway. At worst, it dipped into the mid-teens. When the price of gas was $4 per gallon, customers stayed away in droves. There was also an issue with size. Not the vehicle’s exterior footprint, but the space inside. Despite its exterior size, the interior felt cramped, and that claustrophobia got worse the further back you went. If the second row felt tight, the third row was a penalty box, with none of the amenities offered to the passengers one row ahead. So, while the Tribeca was a failure, it also presented a perfect punchlist of items for Subaru to address when it tried again. 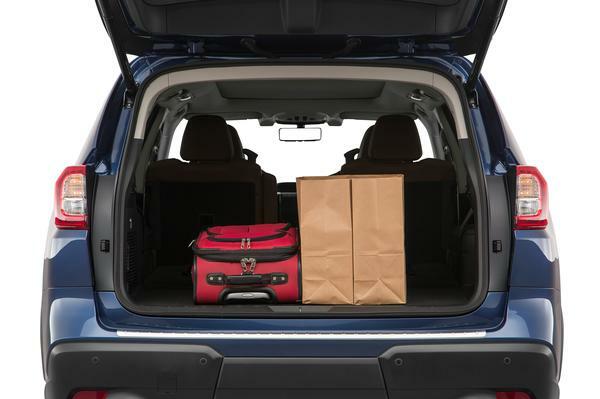 With the Ascent, Subaru checks every single box and then some. I was picked up at the airport in an Ascent Premium — the middle of the road trim level that will represent the lion’s share of Ascent sales. My very first impression of the Ascent was that I wasn’t sure it was an Ascent at all. It looks so familiar as a Subaru that you could easily mistake it for a Forester. It’s not until you get inside that you realize just how different it is. First, the interior looks fantastic, something that Subaru definitely wasn’t know for up until the Impreza redesign and the Crosstrek launch last year. Next, the second row seating area is absolutely enormous. The base trim of the Ascent offers a whole lot of equipment, but it misses two important components: The oil cooler that allows the Ascent to reach its 5,000 pound max towing capacity, and the ability to opt for captain’s chairs in the second row. Those two individual seats are comfortable and spacious. They recline, but they also slide fore and aft, allowing for more than generous legroom, even when full-sized adults are in the front seat. I spent 90 minutes in Portland traffic in the second row, and felt comfortable the entire time. On the headliner, I had an individual air vent and reading lights that are standard in every Ascent model. (The third row gets reading lights as part of the step up to the Premium trim). 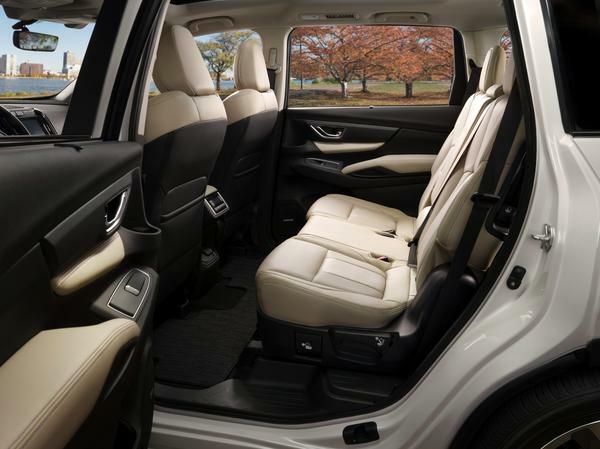 Heated second row seats are an option in the Premium model with the All-Weather Package, and are standard on the Limited and Touring trims. Normally, we wouldn’t spend this much time talking about what it’s like to be a passenger, but honestly, the second and third rows are some of the Ascent’s most important attributes. All of that would be irrelevant if the Ascent wasn’t a capable driver. In all honesty, I wasn’t sure how capable it was going to be, because I’m from the old school that expects at least a V-6, or possibly even a V-8 when considering a good-sized, eight-passenger family hauler. On paper, a 2.4-liter four-cylinder can’t possibly cut it, especially when mated to a continuously variable transmission. But pretty amazingly, it gets it done with ease. 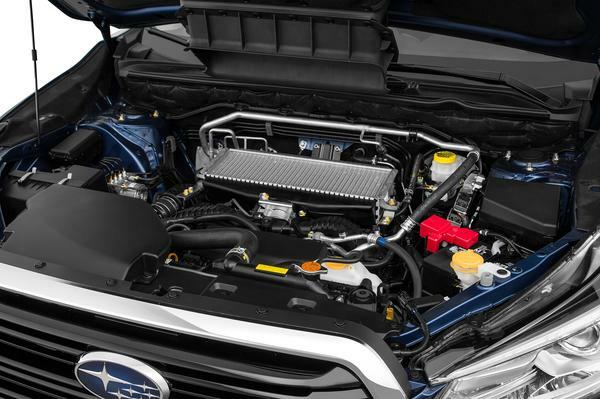 The engine is part of an all-new family for Subaru. I couldn’t pry any secrets out of anyone on staff, but I wouldn’t expect it would be too long before you saw some variation of this 260hp turbocharged engine sliding its way into something more performance-oriented. 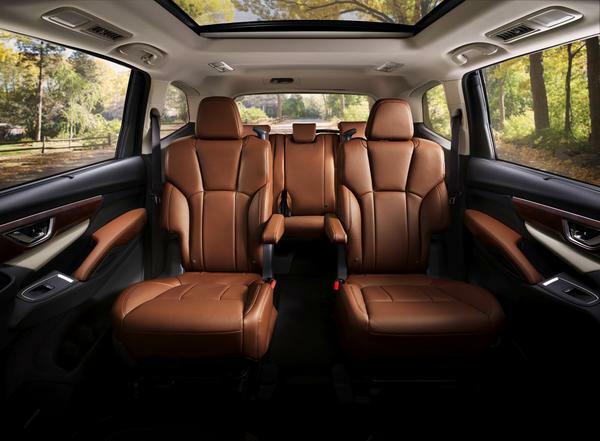 The Ascent clocks in at around 4,500 pounds, depending on the trim level. It’s surprising, then, that the 2.4-liter engine can get it to 60 miles an hour in just 7.4 seconds. Out of any manufacturer offering a CVT, Subaru’s done the best job making it palatable. When we drove the Crosstrek at launch, we were surprised to find that we liked driving it more than the available six-speed manual. In the Ascent, it feels just as well mannered. A vehicle like the Ascent isn’t intended to be some kind of an off-road champion, but there’s a lot of capability baked in. Approach and departure angles are better than most of the Ascent’s natural competitors, as is the 8.7-inches of ground clearance. 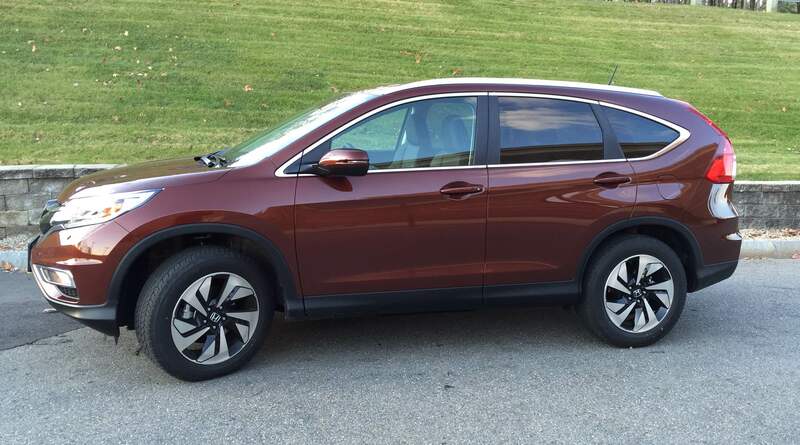 Every trim level also gets X-Mode as standard equipment. In light off-road conditions, it does a remarkable job managing traction when climbing a hill. It does an even better job descending. With X-Mode engaged, you simply keep your feet off the pedals and the system manages a safe speed until you get back to flat ground. 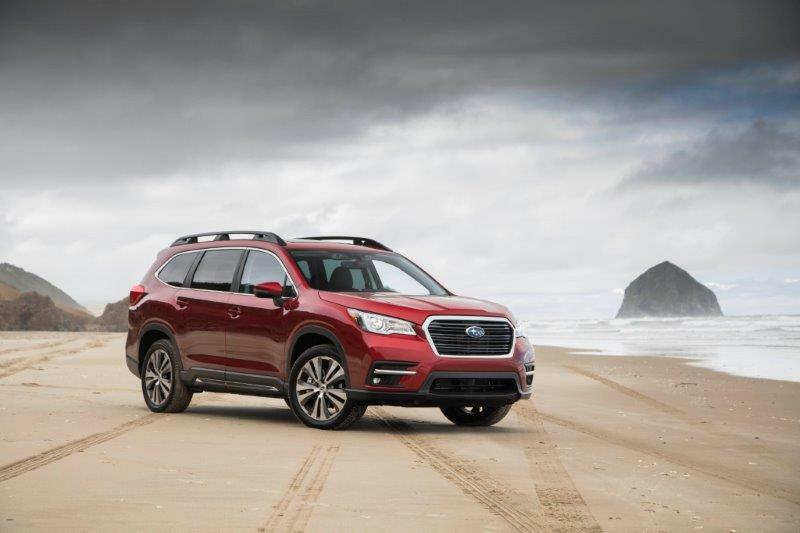 We also had a chance to drive the Ascent on the beach, and the Symmetrical All-Wheel Drive system had no issues clawing through the soft stuff, even with the equipped all-season tires. A more aggressive tire choice would make it even better. 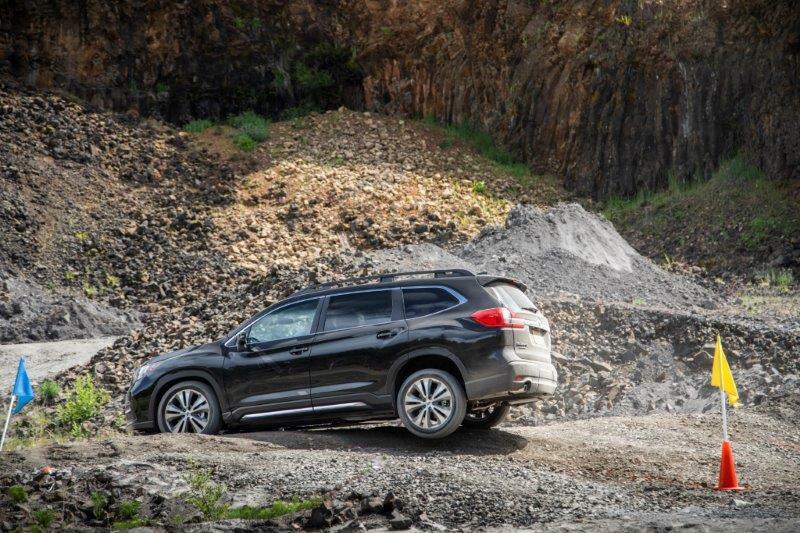 One of the Ascent’s most impressive features is its towing capability. We had the opportunity to haul a fully loaded Airstream travel trailer that weighed in at about 4,000 pounds. It barely felt like there was anything behind us. Not only are the engine and transmission up to the job, but so is the amazingly stiff chassis. 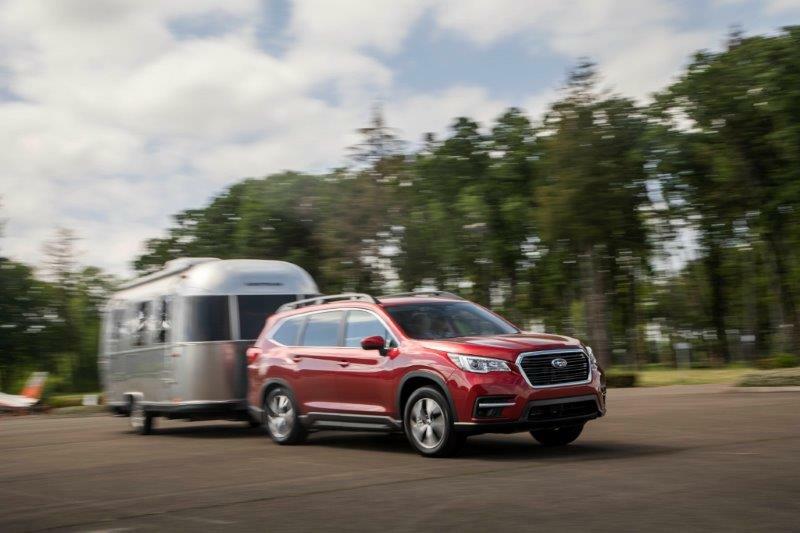 Trailer Stability Assist helps to maintain vehicle stability while towing. The Ascent is also equipped with Trailer Stability Assist, which helps keep a trailer in line. The TSA system uses yaw sensors to monitor trailer sway and then brakes individual wheels to stabilize the vehicle and trailer. We didn’t get to tow at high altitude, but we’re told that the turbocharged four-cylinder is remarkably good at thinner atmosphere. That gap in Peter Tenn’s presentation represents a number of Subaru loyalists that have been forced to move to other brands as their families get bigger. This vehicle plugs that hole almost completely, and should generate some conquest sales from other brands, as well.